Every spring, the sophomore magnet students flood off charter buses with bits of mud still peeking from some of their scalps. “Wallops was so fun,” they say. “ We have to go back!” Yet, the years pass, and no one sets foot on the campus of the Chincoteague Bay Field Station again, letting the most cherished magnet adventure fade into a distant memory. We changed this. We, Mikaela and Emma, didn’t just revisit the field station—we lived there for nine whole weeks as part of the Sea S.T.A.R program. Furnished with a broken refrigerator, wobbly toilet, beetle-infested shower, and a refreshing lack of air conditioning, House 63 became our new home. Don’t worry, after upgrading our living space with string lights, whiteboards decorated with haikus for each other, and a fancy set of orange lawn chairs, we hardly noticed the spiders that crawled across our toes. In fact, although we’re back in Maryland, we still consider House 63 to be our true home. Throughout the summer, we spent most of our time organizing and teaching a marine science program. The objective was to bring together grandparents and grandchildren to learn about and enjoy the local coastal ecosystems. Equipped with a fashionable ensemble of waders and a bug suit, we had the chance to spend our days watching the eyes of kids light up as we showed them the adaptations of periwinkle snails and watching the eyes of their grandparents light up as they saw their grandchildren learning. 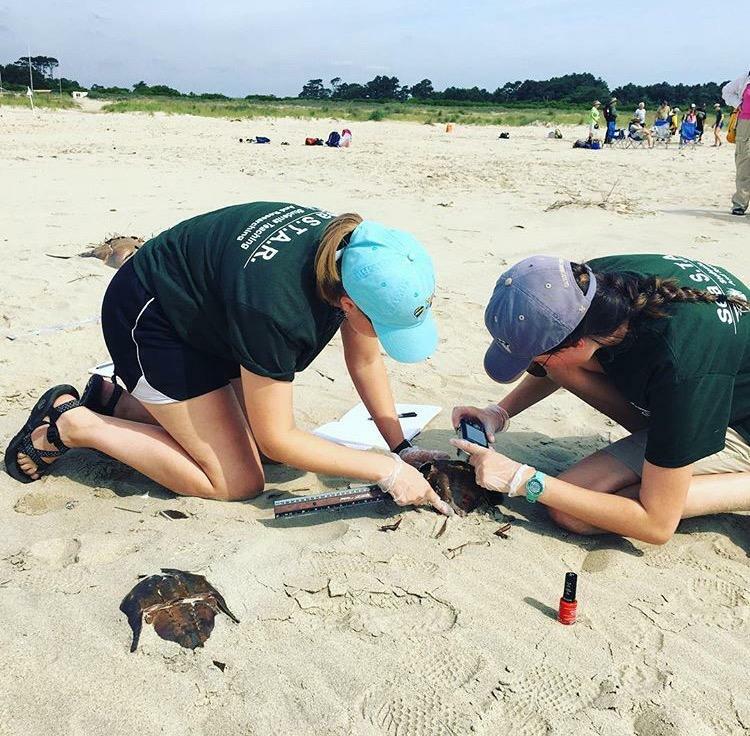 To complete our SRP project, we tirelessly collected data each week on the local Atlantic horseshoe crab population to investigate causes of mortality. No amount of sweat, sand, or dehydration could stop us. We were the first ever to conduct research on this species in this location, and the only adult assistance we received was by emailing scientists from around the nation. It was a euphoric feeling to be completely self-motivated—driven only by personal curiosity and passion instead of by competition or external pressures. After comparing our data set with data sent to us by a professor from the University of Florida, we noticed several trends, including evidence suggesting higher mortality rates in females—a fascinating and concerning phenomenon that warrants further investigation. When we weren’t working, we spent our time with the five other interns. They came from states all around the nation, including California, Indiana, and Delaware, and each had something unique to offer. We concluded each day comparing sunburns and bug bites and pigging out on microwave food while playing truth or dare. Some nights were more exciting with trips to rocket launches, marshmallow fights, and homemade slip-and-slides in the rain. Being out in the coastal environment gave us the opportunity to witness what can only be described as “extraordinary”. We raced down beaches in the night with dinoflagellates glowing under our toes. We swam after dolphins and cheered on breaching whales from the shore. We watched newborn whelks emerge from their egg case and enter the world. We examined fresh sea turtle corpses and probed dolphin skeletons. We helped a sea cucumber return to the waters as it expelled its internal organs. The list could go on for pages. At the end of the nine weeks, we reluctantly abandoned House 63. “Wallops was so fun,” we said. “We have to come back!” Now, we dream of the causeway views and our mouths water recalling the local black raspberry ice cream. The memories are so blissful, sometimes the summer seems like nothing but a dream.